Campus Security Watch AN EYE ON WHAT'S HAPPENING Dillo Day Safety at Northwestern University DILLO DAY IS AN ANNUAL FESTIVAL AT NORTHWESTERN UNIVERSITY in Illinois that takes place on the last Saturday of May. Begun in 1972 when a group of Northwestern students from Texas held a small celebration in honor of the armadillo, the day is characterized by an all-day music festival and special events on the Northwestern Lakefi ll on Lake Michigan. According to an article in The Daily Northwestern, this year a "Smart Dillo" campaign that seeks to use humor to remind students to be safe on Dillo Day was created by the Dean of Students' offi ce and the Norris University Center Marketing team, according to Norris Marketing Manager James McHaley. 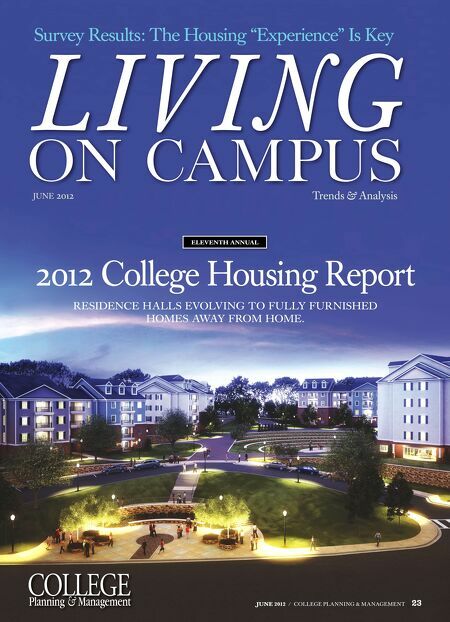 "The fi rst objective was to not make it as harsh as it's been in the last couple of years," McHaley says. "There's been some pretty direct mes- sages. We wanted it to be lighter but to still enforce the same messages." Fliers designed with pictures of plastic armadillos and red Solo cups have been posted around campus to remind students about respon- sible behavior. The fl ier photos are also posted on Smart Dillo's Facebook and Twitter accounts, which members of the campaign say were an important part of communicating with students. Animated GIFs are in place on the Facebook page to remind Dillo Day participants to "Eat real meals throughout the day" and to "Follow the law" because "Fines are pricey." One response on Smart Dillo's Twitter feed observes, "Daang, this year's Dillo Day PSAs are off the chain! Nice work, @SmartDillo!" According to The Daily Northwestern, Grace Kaufman, a graduate assistant to the assistant dean of students, says it is important to connect to students on a level that they understand while informing them of the University's available services. Kaufman says the team will reevaluate this year's Smart Dillo campaign to see if the same strategy can be used next year or if the excitement surrounding the new posters will fade. Kansas State Promotes 'Buckle Up' on Campus At Kansas State University (K-State) in Manhattan, drivers saw an increased po- lice presence on campus earlier this month as the University Police Department joined more than 150 other law enforcement agencies in aggressively enforcing the state occupant restraint and other traffi c laws as part of the 2012 Kansas Click It or Ticket traffi c enforcement campaign. The activity was supported by a grant from the Kansas Department of Transportation. 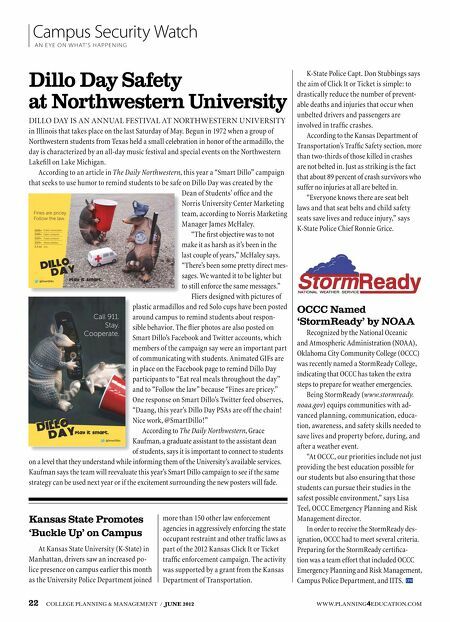 22 COLLEGE PLANNING & MANAGEMENT / JUNE 2012 OCCC Named 'StormReady' by NOAA Recognized by the National Oceanic and Atmospheric Administration (NOAA), Oklahoma City Community College (OCCC) was recently named a StormReady College, indicating that OCCC has taken the extra steps to prepare for weather emergencies. Being StormReady (www.stormready. noaa.gov) equips communities with ad- vanced planning, communication, educa- tion, awareness, and safety skills needed to save lives and property before, during, and after a weather event. "At OCCC, our priorities include not just providing the best education possible for our students but also ensuring that those students can pursue their studies in the safest possible environment," says Lisa Teel, OCCC Emergency Planning and Risk Management director. In order to receive the StormReady des- ignation, OCCC had to meet several criteria. Preparing for the StormReady certifi ca- tion was a team effort that included OCCC Emergency Planning and Risk Management, Campus Police Department, and IITS. CPM WWW.PLANNING4EDUCATION.COM K-State Police Capt. Don Stubbings says the aim of Click It or Ticket is simple: to drastically reduce the number of prevent- able deaths and injuries that occur when unbelted drivers and passengers are involved in traffi c crashes. According to the Kansas Department of Transportation's Traffi c Safety section, more than two-thirds of those killed in crashes are not belted in. Just as striking is the fact that about 89 percent of crash survivors who suffer no injuries at all are belted in. "Everyone knows there are seat belt laws and that seat belts and child safety seats save lives and reduce injury," says K-State Police Chief Ronnie Grice.